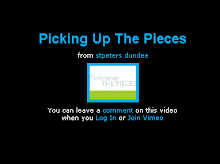 This inspirational video can be seen if you Click Here. Chris Moyles comments on Baptism! 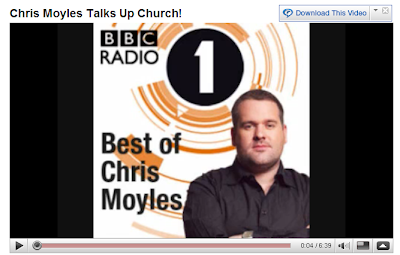 Chris Moyles the well known Radio One host is heard on this clip commenting on a TV broadcast during the Easter Baptism service from Kingsgate Church in Peterborogh, England. To see the video click here. Manchester United's Christiano Ronaldo has just been sold to Real Madrid for a record £80 Million pounds. To try to get a handle on that the media in the UK have been asking what would that buy? How many David Beckhams and so on. I did a quick rekki to discover that £80 Million pounds would sponsor 33,333 children for 10 years at £20/month. Many Millions of children and adults will die this year due to hunger, disease and as a result of dirty/diseased water. In this time of financial crisis it is an insult to poor families around the world to see a young sportsman like Ronaldo being exchanged such a colossal amount of money, a percentage of which he will 'earn' himself of course for playing football each week. Saying it and doing it? How do we respond to the model Jesus left for us? Someone once said "...many Christians do as Jesus did and many Christians say what Jesus said but what we need are Christians who both say what Jesus said and do what Jesus did...". We need the complete package if we are to fulfil the mandate that Jesus left for us. The book of James in the Bible is much maligned as one which seems to divert from the Reformed Evangelical track of Sola Scriptura (by scripture alone), Sola Fide (by faith alone), and Sola Gratia (by Grace alone) etc. I am however sensing that the Church in the western world needs to get back into its stride, take a more balanced view and both say and do. There is no need whatsoever for us however to throw the baby out with the theological bathwater and sideline the Solas but to add to our repertoire the practical application of our faith. 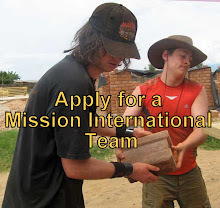 Mission International's purpose is to endeavour to both say and do. 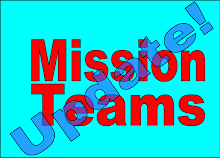 Our teams travel to various parts of the world to share the Good News about Jesus as He commanded us to do, and we also partner with local NGOs to implement projects which will support the poor as Jesus called us to do. If you or your church/group would like to join us in obeying Jesus' commandments then please contact us to see where you can best get involved. 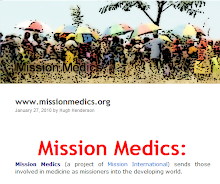 mail@mission-international.org or you can begin by looking at the various project blogs (Mission International Blogroll) listed on the right column of this blog. Please don't say and do nothing. Some further news on the plight of Pakistani Christians: We have been reporting news of the abuses which Pakistani Christians have had to suffer in recent days, to see more pictures and read their story please click here. 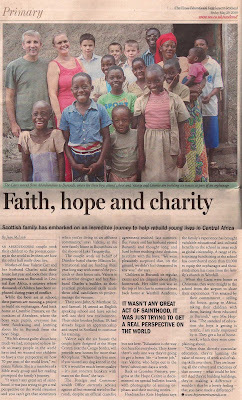 Charles & Val Carr, now home in the UK after a 10 month period building the Hope Centre in Burundi are featured in the TES article below. 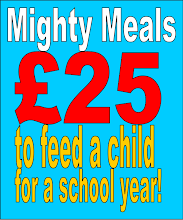 We have just received some news from Uganda where Mission International's Mighty Meals 'BIG Meal', a Christmas meal for children inthe developing world, has been apprereciated by many. Letter from Pastor Sunday who manages Mighty Meals in Uganda. Click here to see more on this story. King is Queen of the track! Grandmother, Janet King a hairdresser from Port Seton completed the Edinburgh marathon in 5hrs 15 mins. Her run was in support of the Hope Centre in Burundi. 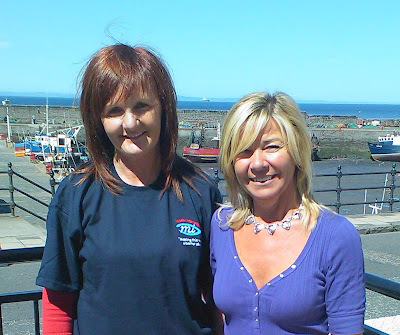 Janet (Left in the picture below) seen here with her colleague came to visit the teams training day to introduce herself. It was really good to meet her and to hear of her efforts in fundraising, a final total thought to be in the region of £1000 will be posted here soon. Janet's run took place on one of the hottest days of the year (31st May 2009) and so it is a great achievement for her to complete the whole course in such a fantastic time. We all want to say a huge thank you to Janet and to everyone who contributed to her sponsorship - Well done! Pakistani Christians need your support! 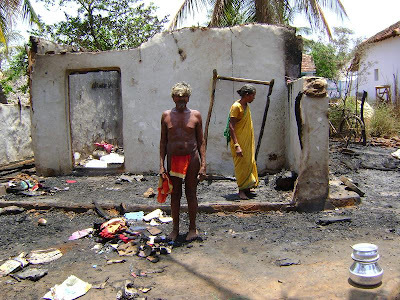 Can you help those who are suffering right now? 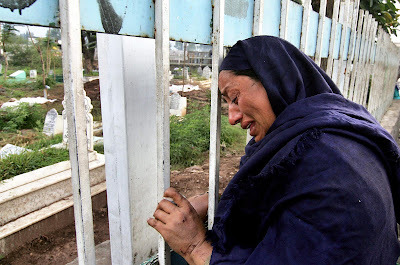 Here a mother stands outside the graveyard weeping after the death of her young son due to violence against Christians in Pakistan. She is one of many who have been brutalised by Islamic extremists recently. 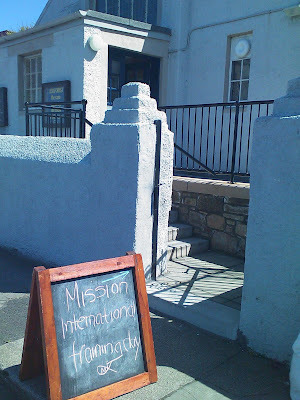 Mission International has sent some support but needs so much more. If you can help please use one of the options at the top right of this page. To see more on this story please click here. The fifteen strong Burundi team received a course of training to prepare them for their trip last weekend. The team, from a wide variety of age groups, were very attentive as they were given information regarding their trip from Mission International staff. For more information on this story please click here.